I tried to stay awake to watch the 2011 Scotiabank Giller Prize that was broadcast on CBC Nov. 8, but jet lag from my recent trip to Manitoba caught up with me. The 2011 winner of the Scotiabank Giller Prize was announced at a black-tie dinner and award ceremony in Toronto hosted by Jian Ghomeshi: Esi Edugyan of Victoria, BC was awarded the top prize for her novel Half-Blood Blues, published by Thomas Allen Publishers. More than 500 members of the publishing, media and arts communities were in attendance at The Four Seasons in Yorkville. David Bezmogis for his novel The Free World, published by HarperCollins Publishers Ltd.
"Imagine Mozart were a black German trumpet player and Salieri a bassist, and 18th century Vienna were WWII Paris; that's Esi Edugyan's joyful lament, Half-Blood Blues. It's conventional to liken the prose in novels about jazz to the music itself, as though there could be no higher praise. In this case, say rather that any jazz musician would be happy to play the way Edugyan writes. Her style is deceptively conversational and easy, but with the simultaneous exuberance and discipline of a true prodigy. Put this book next to Louis Armstrong's "West End Blues" – these two works of art belong together." 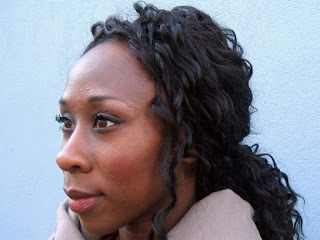 The 33-year-old Esi Edugyan, born in Calgary, received degrees from the University of Victoria and Johns Hopkins University. Her work has appeared in several anthologies, including Best New American Voices 2003. Her debut novel, The Second Life of Samuel Tyne, was published internationally to critical acclaim. She lives in Victoria, British Columbia with her husband Steven Price, a poet and writing instructor at the University of Victoria. The awards ceremony included celebrity presenters Lisa Ray, Zaib Shaikh, Robbie Robertson, Nelly Furtado, Ron Maclean and Jacob Hoggard. Read more about the evening's ceremony in the Toronto Star.